Hape began his career with New Zealand Warriors in the NRL, making the switch to England with Bradford Bulls in 2003. He was a great success in Super League and won his first international cap for New Zealand in the 2004 Tri-Nations. While his time in Bradford was interrupted by several injuries, including a serious knee problem, he remained a favourite of the fans and was voted as a member of their 'Team of the Century' in 2007. In 2008 he announced that he would be switching codes to join Guinness Premiership side Bath. Hape's introduction into union was slow, but as his experience grew his quick feet made him a potent weapon in the Bath midfield. After a strong start to the season for the west country side in 2009-10, he was called into the England squad for the Six Nations after qualifying through residency. While illness meant that a Test bow eluded him during the tournament, he was recalled for England's summer tour to Australia and was named in the side for the first Test in Perth. Hape tasted defeat on his international bow in union but, after retaining his place in Martin Johnson's starting line-up, he was on the winning side a week later as England upset the Wallabies in Sydney. Hape held on to the No.12 jersey for all four of his adopted nation's November Tests and was also included in the squad for the 2011 Six Nations. Hape started every game of the 2011 Six Nations and in February announced he would move to London Irish for the 2011-12 season. In June 2011, Hape was included in England's 45-man training squad for the World Cup. 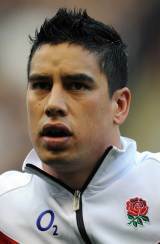 Hape made the final 30-man squad but made just one appearance as Manu Tuilagi and Mike Tindall, and laterly Toby Flood, were preferred in midfield.